Two months after successfully holding the elections of Federal Parliament and Provincial Assemblies, Prime Minister Sher Bahadur Deuba announced his resignation on Thursday, paving the way for the left alliance to form a new government. Deuba, also the President of Nepali Congress (NC), stepped down as PM a day after the Election Commission (EC) submitted the final results of the federal and provincial assembly elections to President Bidya Devi Bhandari. In his valedictory speech from PM's office residence in Baluwater, Deuba summarised the tasks carried out by the government under his leadership. “The elections to three tiers of government—753 local bodies, seven provincial assemblies and a federal parliament--have been successfully held under my leadership setting the foundation to end a long transition,” PM Deuba said in his 15-minute televised address to the nation. PM Deuba officially handed over his resignation to President Bhandari after the address. The left alliance had already presented its claim for the new government to President proposing UML Chairman KP Sharma Oli as the new PM. Deuba was elected as the 37th PM on June 6 with the support from CPN (Maoist Centre), which is now a key partner of the left alliance, and is considering merger with its ally CPN-UML. Left alliance of CPN-UML and CPN (Maoist Centre) emerged victorous in the recently held elections to Federal Parliamentary elections and Provincial Assemblies and is poised to form a new government. Saying that the government under his leadership successfully completed three tier elections necessary for the implementation of new constitution of federal democratic Nepal, Deuba said the polls have created a strong base-pillar to take the country on the path of prosperity. “For this, I would like to thank and congratulate all the Nepali citizens. I take this opportunity to recall all the martyrs and leading actors of the democratic movement,” said Deuba. 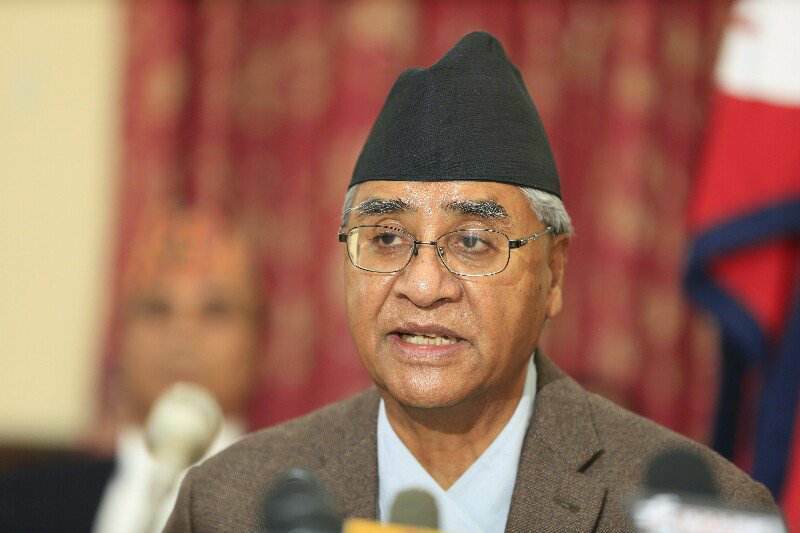 Deuba expressed his sincere thanks to the members of Cabinet, policy makers, government employees, office bearers of constitutional bodies, security agencies, the coalition partners and the parties who supporter his government, political leaders and cadres, media, and well-wishers, for their supporter in successfully concluding his challenging tenure. “I have accomplished my commitment to implement the constitution and conduct elections in a peaceful manner. I have expedited new Acts; manage human resource as per the new administrative structures and other technical aspect for the implementation of the constitution,” he noted. Acknowledging the fact that his government could not expedite development works due to his responsibility of conducting elections, Deuba said the government, however, has been able to make a remarkable progress in big infrastructure development works. He said that his made the decision to construct Budhi Gandaki Hydropower Reservoir Project on domestic investment and assigned Nepal Army to construct Kathmandu-Tarai fast-track. He further claimed that his government provided impetus to various national pride projects including Arun III Hydropower, Upper Tamakoshi Hydropower, Bheri-Babai Diversion, Postal Highway and Pokhara Regional Airport. “I recently inaugurated 30-MW Chameliya Power Project in Darchula and 300-bed modern hospital in Jumla,” said Deuba, adding that the government has signed the biggest grant in Nepal’s history under USA’s Millennium Challenge Corporation and made the Poverty Alleviation Trust more effective. Saying that his government’s foreign policy put national interests and public benefit at its core, Deuba said he made constant effort to strengthen mutual relationship with international community and friendly nations including USA, UK, Japan, European Union, among others. “Our historic and friendly relationship with two big neighbours India and China have been made more trustworthy and respectable during my tenure,” said Deuba. He claimed the country’s economic condition shattered by protracted political transition, devastating earthquake and border blockade has been gradually improving. The foreign investment in Nepal’s development works have been increasing, he said. He said a high-level Medical Education Commission was formed to curb the malpractices seen in the medical sector. Defending his decision to reduce the age for elderly allowance from 70 years to 65 years, Deuba said the average life expectancy is below 70 in over 50 districts of Nepal. He said his government decided to provide a monthly allowance of Rs 5000 to people with terminal illness such as cancer, kidney failure, paralysis caused by spinal injury. He said the post-earthquake reconstruction has gained momentum during his government's tenure.